Mr. Yin Fei has nearly 20 years working experience in commercial bank and has been focusing on the field of mergers and acquisitions in healthcare. 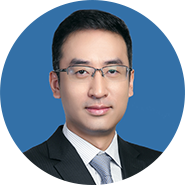 Since he joined Ping An Bank，he has successively held the posts of Vice President and President of the Finance SBU of Healthcare Culture &Tourism Industries, and been responsible for nearly 40 healthcare investment projects (involved cross border mergers and acquisitions, buyout fund, privatization, etc.) with respect to healthcare enterprises including WuXi AppTec, Luoxin, Mindray, Luye Group, CMS, AIER Eye Hospital Group, Jointown, Meinian Onehealth and many others.